The Ciclovia delle Isole follows the the chain of islands along the eastern side of the Venetian lagoon. All very different both the one from the other, and from Venezia proper. 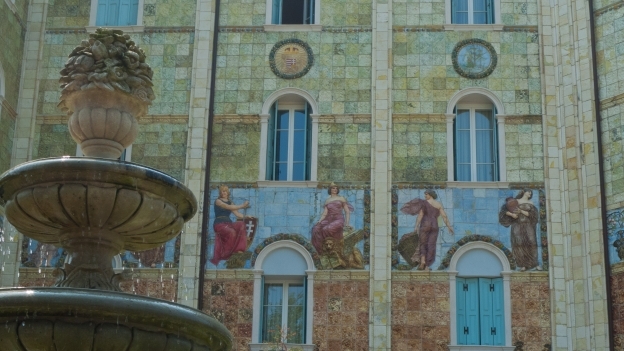 You can go from Chioggia with its roguish charm, to Pellestrina where you can still see fishermen barbe­cuing their breakfast on the quayside, and then a short traghetto ride takes you to the Liberty (Art Nouveau) hotels and villas of the Lido. 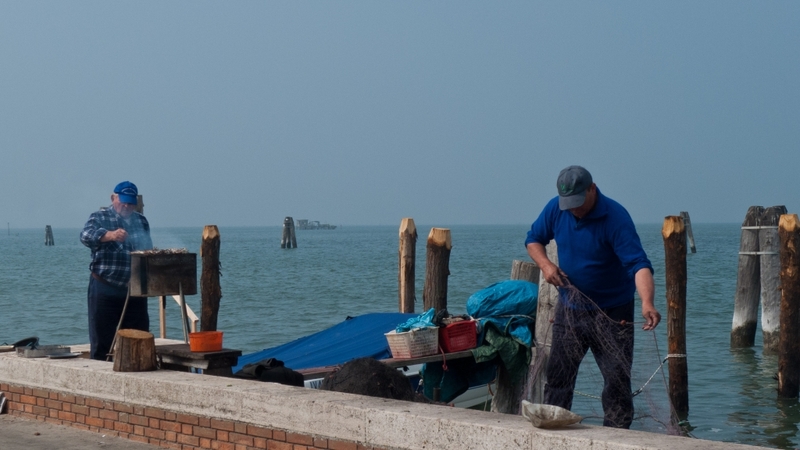 And in between you can watch fisherman barbe­cuing their breakfast on the island of Pellestrina. The first of the islands is Pellestrina - with brightly-painted terraced houses and fishermen rolling up their nets or barbe­cuing breakfast. You couldn’t be further away from the madness of tourist Venezia. The next island, the Lido is very different. It’s worth taking a little time to visit the Malamocco district. There’s then a great ride along the murazzi - the sea walls - the Veneto Tourism roadbook advises that this is only for expert riders - this seems a bit over the top as the path is concrete, reasonably well surfaced, and protected by a metre-high sea wall. At a couple of points there was sand on the path which could prove a a problem for the unwary. The roadbook also says to avoid this route at busy times - which is probably true as there isn’t a lot of space. The Lido itself is north of Malamocco. Leafy with ‘Liberty’ mansions and luxury hotels including the extraordinary Grand Hotel Ausonia e Hungaria with its beautiful art nouveau tiled facade. Definitely a nice place to be - although I don't dare look at the prices. The next of the islands on the route is Cavallino - although it’s more of a peninsula separated from the next ‘island’ by a waterway. The on-road distance for this section is relat­ively small, but as you are dependent and on ferries, allow plenty of time: it took me about 3 and a half hours from Chioggia to Punta Sabbioni; I might have been able to do it in 3 but not much less than that. Bear in mind also that the carriage of bikes on the ferries is subject to space. If you're starting from Chioggia then it would be worth starting early. (At the onward connec­tions there were relat­ively few cyclists). See the Practicalities section below for inform­ation about fares and timetables. 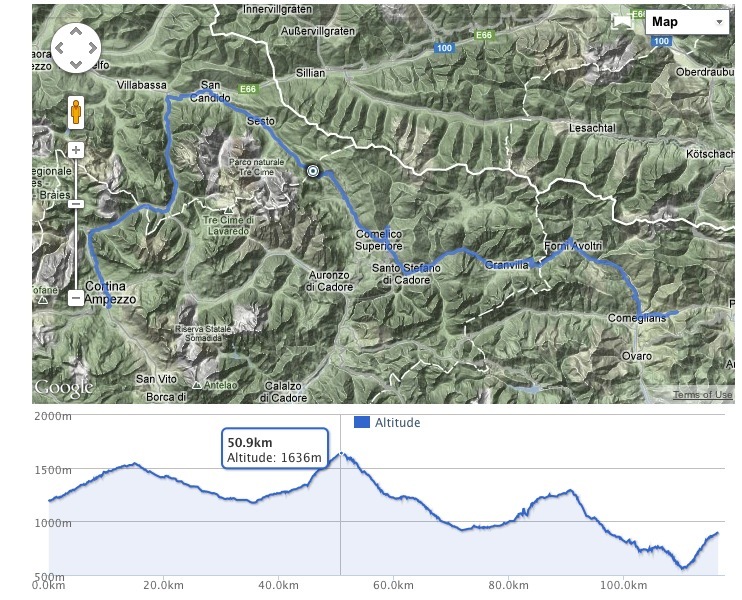 Run your cursor over the graph to show the elevation, and distance from the start, for any given point on the route. (Note: the altitude graph is not shown where the route is flat). You could bypass Venezia and just keep going after Cavallino. But I expect most people will want to take the oppor­tunity to see Venezia itself. Your best bet is to stay on the islands and make use of the vaporetto services. For my money, the best way to see Venezia for the first time is from the deck of a vaporetto. 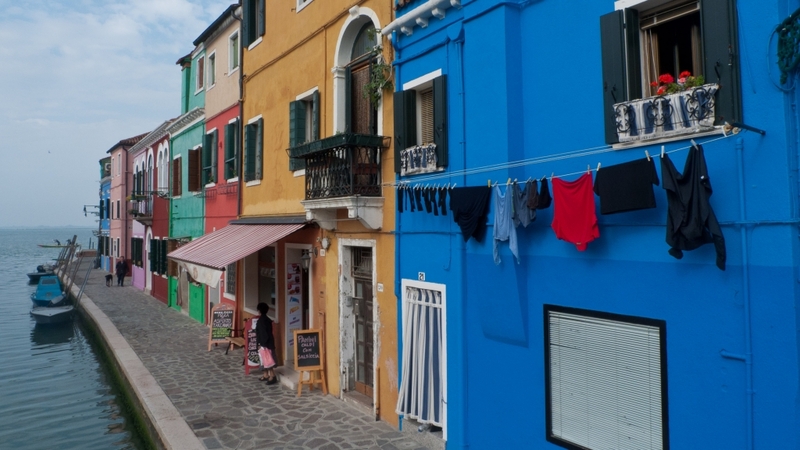 As well as the main island of Venezia don’t miss the islands of Murano, Burano and Torcello. Punta Sabbioni and the Lido di Venezia are probably the best places to base yourself if you plan on spending a day or two visiting the city. I did this route in May. I suspect that in the peak tourist season this route would be trickier simply because of the numbers of people around. Probably the most practical and economic option is to look for a place to stay on the Lido and take a traghetto into Venezia. Mestre is on the mainland and is, effect­ively, the modern Venezia. Many hotels will be listed as being in Venezia when strictly speaking they are in Mestre. If you use these links to book accom­mod­ation Booking.com will pay me a small part of their commission. This helps support the costs of producing this site. I use Booking.com to find and book places to stay when there are no campsites in the area. The large majority of hotels and many hostels are now on ‘Booking’. I like it because it means that I can get almost-instant confirm­ation. The rating system is also a reliable guide to the quality of the accom­mod­ation. I’ve never had a problem finding places to keep my bike —even if it’s a cupboard or store room. I always use the ‘special requests’ field on the booking form to tell the hotel that I’m travelling with a bike, which gives them the oppor­tunity to let me know if there’s a problem. Many properties offer free cancel­lation but it’s a good idea to check the condi­tions as these vary from property to property. There are several hostels in Venezia, but the ban on bikes rules them out. You may be able to get to the Ostello Venezia on the Giudecca island rather than the main island of Venezia, but I suspect that it may not be possible to get there with a bike. There's also the Ristorante-Ostello Venissa. This is on the Isola Mazzarbo which you easily reach from Treporti without going to the main island. This should be possible: I spoke to a member of the transport company staff about whether you could take a bike on the traghetti provided you didn't go to Venezia itself; she thought about it for a while and then said 'yes' - but you could be unlucky enough to meet someone who says 'no'. If you're inter­ested in this option it might be worth contacting the ostello itself for advice. There are a number of campsites at Punta Sabbioni, and lots more in the Cavallino-Treporti area, but my recom­mend­ation would be for the Agricampeggio Al Batéo. It’s only a small site so in in peak season it would be worth calling ahead. The Camping San Nicolo’ on the Lido is conveni­ently located, and looks like it would also be a good bet. Costs: the most economical ticket is probably the 12-hour ticket at 16€; if you pay stage-by-stage it’s 5€ for Chioggia-Pellestrina and 6.50€ for each stage after that (2012 prices). On top of that you need to pay 1.10 for the bike for each ferry journey. You can buy tickets on the boat - but bear in mind that you can only buy the 12-hour timed ticket at the ticket offices (eg Chioggia, Porta Santa Maria Elisabetta, and Punta Sabbioni). You could do part of this route as a day ride returning on the number 11 ferry which connects the Lido with Alberoni, Santa Maria del Mar, Pellestrina and Chioggia - it takes about 75 minutes to do the whole journey. 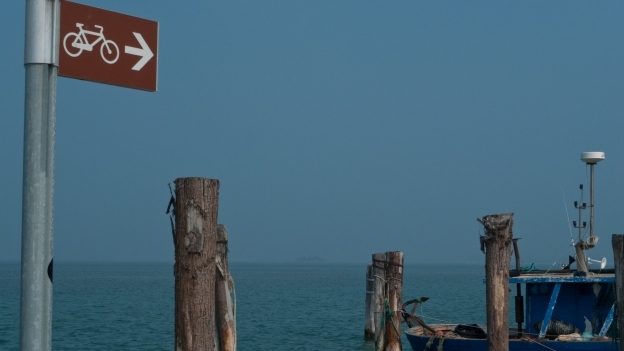 Venezia has a major rail station, plus the airport and inter­na­tional ferry terminal. However, the restriction on bikes on boats going to Venezia proper means that getting to the station or the airport is not straight­forward: if you want to avoid having to make a long detour round the lagoon then the best option is to ride to the Lido (or take the number 11 ferry) and then catch the number 17 ferry to Tronchetto. The Tronchetto is right next door to the inter­na­tional ferry terminal. Getting to the the Venezia Santa Lucia station is more tricky: you basically need to get onto the SS11 as if you were heading for the mainland and then turn right following the signs for Piazzale Roma and then take the pedes­trian bridge to the station (check Google Street View to see what I mean). For the Venezia Marco Polo airport you’d need to cross over to Mestre on terra firma then follow the SS14 - if you have the choice it would probably be better to chooses another departure/​arrival airport. Veneto Tourism- E5 - Islands of Venice cycle path The English version of the page doesn’t include a link to the pdf of the leaflet with the route map (although this is available in English) here’s the link to the pdf download .